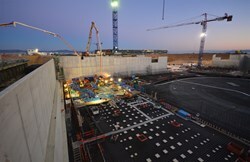 As the sun comes up over the ITER site on 11 December, the first pouring operations are already underway. Twelve hours were necessary to fill the 550 m² segment, the first of 15 segments that will make up the Tokamak Complex basemat. 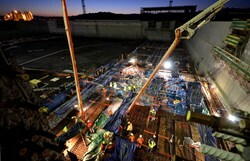 In the cold, predawn hours of Wednesday, 11 December, concrete pouring began for the basemat of the Tokamak Complex, the suite of buildings that will house the ITER fusion experiments as well as diagnostic and tritium management systems. 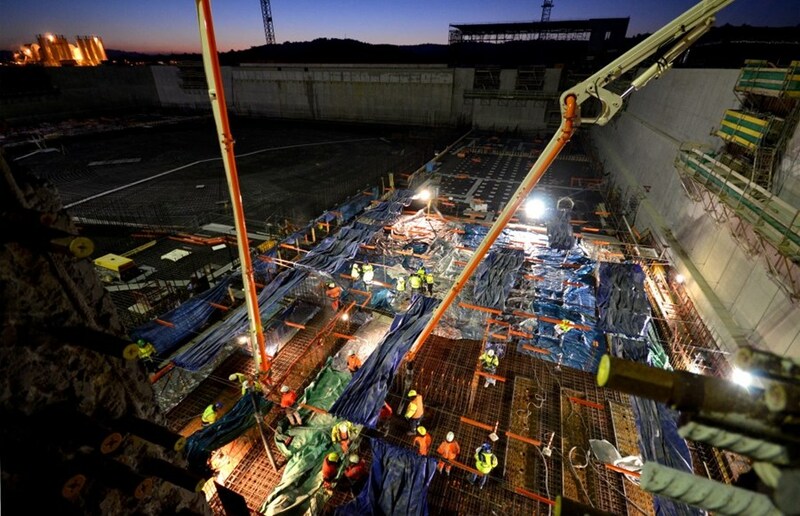 "We are all very happy and may I say relieved to have reached this important and visible milestone for the ITER Project," said Laurent Patisson, leader of the Nuclear Buildings Section who had signed off the night before on the final documents clearing the way for operations to begin. "This is the beginning of B2 basemat slab realization, and as I savour the moment I measure all of the work and effort that it has taken to reach this point." Two pumps worked in unison to deliver the special-grade concrete, qualified for the specificities of the ITER facility through extensive testing and produced in an on-site batching plant. 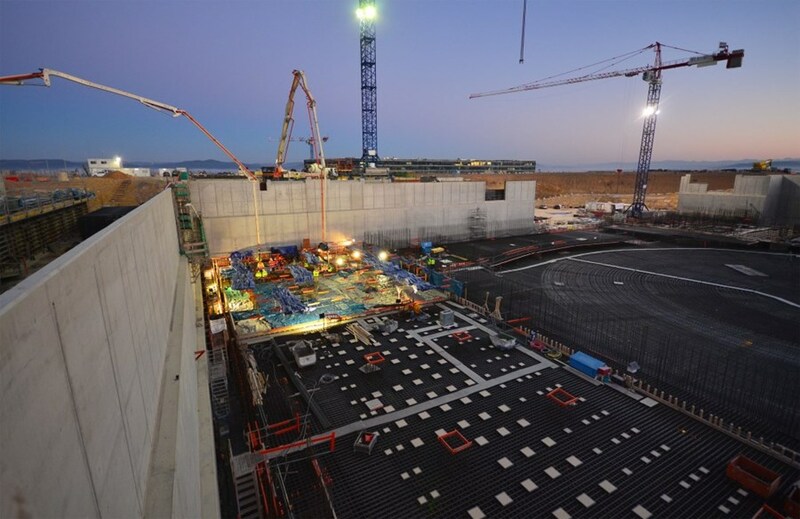 The first concrete began flowing at 6:24 a.m. under powerful spotlights and in the presence of observers from the ITER Organization and the European Domestic Agency, F4E. Over the long day, teams divided into two shifts directed the concrete from the trucks above into the rebar and formwork of a 550 m² segment in the northwest corner of the Seismic Pit, at the location of the future Diagnostic Building. This first "plot" is one of 15 that must be poured over the next six months to complete the B2 slab. Pouring at such early hours, and during the winter months, requires some special measures to maintain the temperature of the concrete at a minimum level—heated water and gravel at the concrete batching plant and tents and hot air blowers at the worksite. In all, 15,000 cubic metres of concrete and 4,000 tonnes of reinforcement will be necessary for the B2 slab, which will act as a single foundation for the three buildings of the Tokamak Complex (Tokamak, Diagnostic and Tritium buildings). 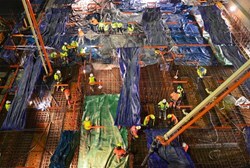 Special measures were put into place to keep the concrete at its minimum required temperature, including protective covers and hot air blowers at the pouring site. "The concrete qualified for the B2 basemat has been the object of particular care," specifies Laurent, "answering to the rigorous requirements of a nuclear facility in terms of stability, water permeability and gas confinement." Over 20 qualification tests have been run by the contractor GTM Construction on the concrete formulation. In the coming months, additional rebar will be added to the central area of the B2 slab. "In the context of design consolidation we have refined the rebar arrangement under the Tokamak Building," explains Laurent. The building contractor will realize a mockup of the new arrangement to test and qualify the proposed concrete. "For the realization of the B2 slab we are relying on the experience and methodology of the contractors (GTM Construction) who already carried out the first works in the Seismic Pit, including the basemat, seismic columns and retaining walls," says Laurent. "Up to now we have been working on paper. We're all eager to get to the next level and see the B2 slab take shape."